There was a time, not that long ago, when you could buy a delicious wine called The Prisoner for about $15 a bottle. This is a red blend from Napa that is both smooth and flavorful with a defined tannic structure that everyone loved. Those were heady days before the world had discovered how good a winemaker David Phinney was. When corporate America discovered just how many bottles of The Prisoner were being sold, they saw dollar signs, and in 2016 Constellation Brands bought the brand for $285 million dollars. Now, you’re lucky to find a bottle for less than $50. So what do people like you and me do when our favorite wine is suddenly priced out of our reach? Using chemical analysis, Replica makes knockoff wines that taste very similar to more expensive brands. They believe, and I agree with them, that if Americans have no problem buying store versions of famous brands of food and medication, they won’t have a problem with buying a generic version of a wine they love, too. Replica brags about their lab which ensures “at least 90 percent chemical similarity to the wine by which each was inspired, in notes such as acid, butter, caramel, citrus, earthy, floral, fruity, herbal, nutty, oaky, smoky, spicy, sweet and tannic.” But does the knockoff wine stack up to the hype? I bought a bottle of Replica’s Pickpocket Red, patterned after The Prisoner, and was pleased with how it smelled and tasted, but I was most ecstatic with the price – $19.99 a bottle! As you can see from the label, it was also rated 92 points by Tastings magazine. 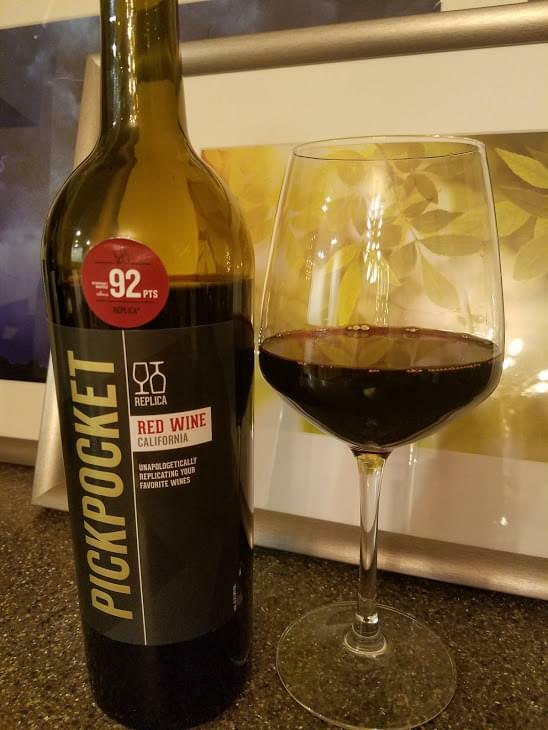 Pickpocket is a red blend of California wine (most likely Zinfandel-based with Shiraz/Syrah, Cabernet Sauvignon and Merlot) with beautiful flavors of black cherry, plum, oak and vanilla blended with velvety dark cocoa. 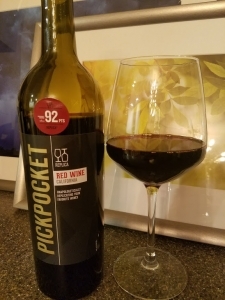 Pickpocket is exceptionally smooth, and perhaps slightly sweeter than The Prisoner, but close enough that you won’t miss not paying that extra $30 per bottle to enjoy a delicious wine with dinner. After my first bottle I went back to The Party Source for more, and they were sold out. When I came back again a few weeks later, there were only four left, which I promptly purchased. 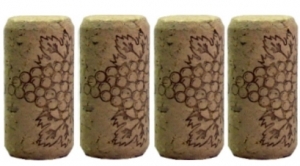 On my four-cork scale based on taste and value the 2016 Pickpocket Red from Replica Wines gets 4 corks! This is a delicious red wine for everyone, a definite crowd-pleaser.